We’d love your help. Let us know what’s wrong with this preview of High Kings And Vikings by Nigel Tranter. brief reigns usually coming to a violent end. know that out of his legacy of hatred, he would find unexpected happiness. To ask other readers questions about High Kings And Vikings, please sign up. This is the 4th Tranter chronologically, taking place at the turn of the first millennium. High kings are being unseated (by death) and Vikings are raiding. Following the characters on Google Maps enhances the reading experience. Those who like Bernard Cornwell's Saxon series would enjoy this book. Uhtred even makes an appearance. Having just bought a batch of Tranter books I was really looking forward to this. I decided to start with this one. Have to say that this is a very poorly written book, lacking description, atmosphere and any good dialogue (most of it is along the lines of then he went to see him and he agreed it was a good idea). The story is also poor. It is set just after Kenneth II has been murdered and follows a series of backstabbings of kings though to Malcolm the destroyer. The story would have been much b Having just bought a batch of Tranter books I was really looking forward to this. I decided to start with this one. The story would have been much better focused on these aspect, but instead these issues are an afterthought briefly mentioned in the background. Instead we have to follow the lame love story of Cormac and Fenella, broken up by Cormac going off to fight Vikings every now any again and even that part isn't exciting. Don't want to be too harsh, I did think it was odd that this book was so rubbish given Tranter's reputation. Having looked into it would appear that this book was written just before he died, so maybe the old spark had left him by then. Scotland 900's. Good so far. 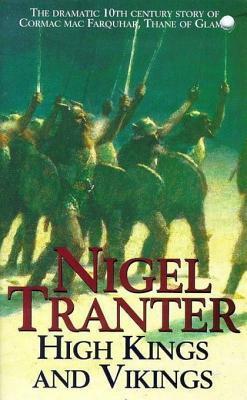 Nigel Tranter OBE was a Scottish historian and author.